Triathletes often equate salad with healthy eating, but if yours isn’t more than a bowl full of rabbit food, it could leave you reaching for chips just before bedtime. Now that the weather is warming up, a cool, fresh salad is an increasingly popular meal option. However, the days are also longer, which means there are more hours available for snacking later in the evening if your dinner salad has left you only 70 percent full. 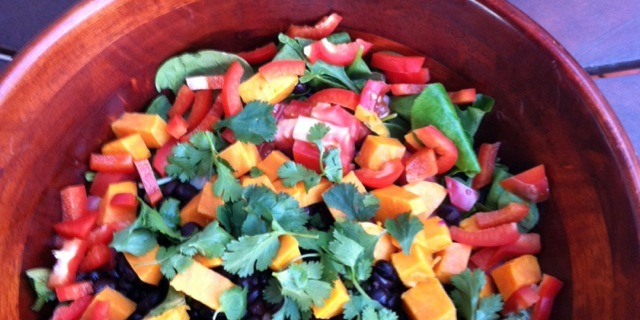 Professional triathlete Linsey Corbin combats the twilight munchies by making sure her dinner salad is a hearty one, and shares her recipe for a Mexican-inspired Black Bean and Sweet Potato Summer Salad. “This is the perfect combo of sweet and savory ingredients tossed together with a tangy and spicy vinaigrette. You can add and subtract ingredients for the salad based on what’s on hand as well,” she says. The salad can easily be made vegetarian by omitting the grilled chicken. To make the salad: Place all the ingredients except for the chicken and avocado in a large bowl. To assemble: Toss salad with dressing. Serve onto plates and top with sliced avocado and grilled protein of choice. Serve with chips on the side.